Senators Lindsey Graham (R-South Carolina) and Bob Menendez (D-New Jersey) are working on a draft law that would impose sanctions on Russian sovereign debt and demand Senate approval for US quitting NATO, among other things. The US must make it clear it will “not waver in our rejection of [Russian President Vladimir Putin’s] effort to erode western democracy as a strategic imperative for Russia’s future,” Graham and Menendez said. Last, but not least, the bill would impose a Senate approval requirement for US withdrawal from NATO. Graham is an outspoken foreign policy hawk and long-time wingman of the Russia-obsessed Senator John McCain (R-Arizona). Last week, he called for the World Cup soccer ball, presented as a gift to President Donald Trump by his Russian counterpart at the summit in Helsinki, Finland to be examined for surveillance devices. As the ranking member on the Senate Foreign Relations Committee, Menendez is a powerful voice among the Democrats, who continue blaming Russia for the outcome of the 2016 US presidential election. It is unclear how much support the Graham-Menendez bill will get in the Senate. However, CAATSA was approved 98-2 last year. Just last week, the Senate voted 98-0 on a nonbinding resolution expressing the sense that the “United States should refuse to make available any current or former diplomat, civil servant, political appointee, law enforcement official or member of the Armed Forces of the United States for questioning by the government or Vladimir Putin,” in response to false reports that former US ambassador to Russia Michael McFaul would be “handed over” to Moscow. Democratic leaders are demanding an open hearing in which Trump administration officials, including the American translator, would explain what transpired in Monday’s meeting between President Donald Trump and Russian President Vladimir Putin. “This is too important not to get the full story out before the Senate and the American people,” Senate Minority Leader Chuck Schumer said at a press conference on Tuesday while flanked by senior Democratic lawmakers. In addition, Schumer demanded that the administration turn over to Congress all contemporaneous notes from the summit. Trump’s first official summit with Putin featured a two hour long one-on-one meeting, followed up by an expanded bilateral meeting in Helsinki, Finland. The two leaders positively assessed the results of the summit, where they discussed the most pressing international issues as well as Russia’s alleged meddling in the 2016 US election. Trump said after the meeting Washington was to blame for the poor state of bilateral relations, and cast doubt on the US intelligence community’s conclusion on the interference in the US vote. Schumer and other Senators said the investigation should feature testimony from Secretary of State Mike Pompeo, Director of National Intelligence Dan Coats, US Ambassador to Russia Jon Huntsman and the American translator in the one-on-one meeting between Trump and Putin. Senator Bob Menendez called Monday a “day of infamy” for the United States, borrowing a phrase used by President Franklin Roosevelt to describe the Japanese attack on Pearl Harbor. “He violated his oath of office to protect and defend the constitution of the United States,” Menendez added. Senator Ben Cardin called for immediate action to protect the United States from alleged Russian aggression. “We need to use the independence of Congress to protect the national security of America, particularly in light of what President Trump has done with Mr. Putin,” Cardin said. Senator Jeanne Shaheen called on the Foreign Relations Committee to hold a hearing with the American translator who was present during the private, two-hour meeting between Trump and Putin to determine what was discussed and what Trump agreed to on behalf of the United States. US Democrats have warned President Donald Trump that they will block any deal with North Korea that does not guarantee a “verifiable” dismantlement of the country’s nuclear weapons and ballistic missile programs. In a letter to Trump on Monday, Senate Minority Leader Chuck Schumer and Senator Bob Menendez said their party was not going to support a deal to ease sanctions on North Korea if the White House failed to meet their conditions. Pointing to the important role that Congress had in enacting a sanctions relief, the opposition leaders warned that they would opt for “tougher sanctions and oversight” if they thought the Republican head of state was moving in the wrong direction. “If we think the president is veering off course, we won’t hesitate to move, but let’s see where he’s headed,” Schumer told reporters later in the day. The letter came days ahead of a highly-anticipated summit between Trump and North Korean leader Kim Jong-un in Singapore on June 12. Trump called of the meeting a short while back, after a brief war of words broke out between the two countries over the terms of a possible deal. Dr. Samuel Johnson’s observation — “A man is seldom more innocently occupied than when he is engaged in making money” — may be a bit of a stretch when it comes to OPEC and the global oil market. And here is the heart of the objection to Tillerson. He wants to end sanctions and partner with Putin’s Russia, as does Trump. But among many in the mainstream media, think tanks, websites, and on the Hill, this is craven appeasement. For such as these, the Cold War is never over. The people who most indignantly condemned Trump’s questioning of Obama’s birth certificate as a scurrilous scheme to delegitimize his presidency, now seek to delegitimize Trump’s presidency. Behind the effort to smear Tillerson and delegitimize Trump lies a larger motive. Trump has antagonists in both parties who alarmed at his triumph because it imperils the foreign policy agenda that is their raison d’etre, their reason for being. Their goal is to bring down Putin and bring about “regime change” in Moscow. This is what America voted for when it voted for Trump — to put America First and “make America great again.” But War Party agitators are already beating the drums for confrontation with Iran. Early in his presidency, if not before, Trump is going to have to impose his foreign policy upon his own party and, indeed, upon his own government. Or his presidency will be broken, as was Lyndon Johnson’s. A good place to begin is by accepting the McCain-Marco challenge and nominating Rex Tillerson for secretary of state. Let’s get it on. Following a similar resolution passed last week by the U.S. House, the U.S. Senate voted Thursday night to support Israel’s ongoing invasion of the Gaza Strip. Senate Resolution 498 was authored by Bob Menendez (D-NJ) and Lindsey Graham (R-SC), with additional support by Ben Cardin (D-MD) and Rand Paul (R-KY). Already under investigation for trying to help a contributor who may have been defrauding Medicare, New Jersey Senator Bob Menendez is reportedly facing another federal criminal probe this time focusing on his relationship with two fugitive bankers from Ecuador. William and Roberto Isaias were sentenced in abstentia for embezzling millions from Filanbanco, a bank they ran that collapsed in Ecuador. The United States has so far refused to hand them over to Ecuador despite an Interpol international arrest warrant and recommendations from officials within the State Department to return the convicted bankers back to Ecuador. “The fact that the Isaias brothers continue to live a life of luxury in the U.S. while their account holders are suffering in Ecuador has been a constant concern between the U.S. And Ecuador since their flight,” said Linda Jewell, a former U.S. Ambassador to Ecuador. Enter Senator Bob Menendez who has allegedly been advocating on the brothers’ behalf. Menendez is said to have used the power of his office to assist the Isaias brothers writing letters to the State Department and Department of Homeland Security. While Senator Menendez was writing letters the Isaias family was giving money to his campaign and the Democratic Party. If a connection between the donations and the letters can be established Senator Menendez might once again have to face ethics charges if not criminal charges. US Senator Lindsey Graham has warned about a possible easing of economic sanctions against Iran, saying Israel is “apoplectic” about the Obama administration’s approach. 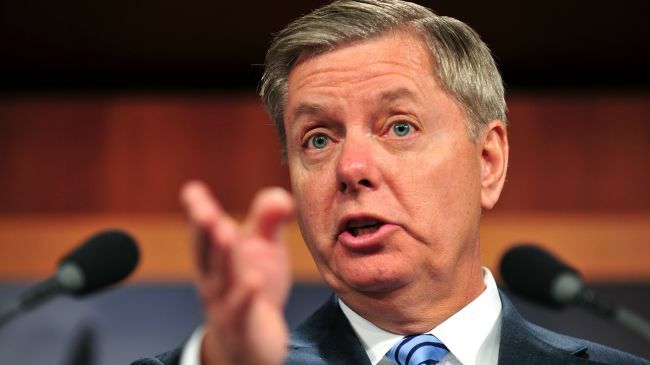 Graham, a hawkish Republican from South Carolina who has repeatedly called for military strikes on Iran, said Sunday that lifting sanctions would send the wrong message to Israel and other US allies in the region. The White House offered a “very modest sanctions relief” as Iran and the six major world powers– the US, Britain France, China, Russia and Germany– engaged in talks over Iran’s nuclear energy program in Geneva, Switzerland over the weekend. The talks ended inconclusively on Sunday when France rejected a list of demands on Iran, saying they were too generous to result in an easing of sanctions. More negotiating sessions are scheduled for November 20. Sen. Graham said the sanctions should be kept in place, and coupled with the threat of military force, to compel Iran to stop its uranium enrichment activities. Senate leaders showed bipartisan support Sunday for tougher sanctions on Iran. Senator Robert Menendez, chairman of the Senate Foreign Relations Committee and a key architect of anti-Iran sanctions, called on Congress to consider new economic sanctions against Iran. Ecuador renounced trade benefits which the US threatened to revoke over the Latin American country’s consideration of harboring NSA leaker Edward Snowden. It offered $23 million a year to fund human rights education for Americans instead. The government of leftist President Rafael Correa came up with an angry response on Thursday after an influential US senator said he would use his leverage over trade issues to cut preferential treatment of Ecuadoran goods at the US market, should Ecuador grant political asylum to Snowden. He added that Ecuador is willing to allocate $23 million annually, an equivalent of the sum that it gained from the benefits, to fund human rights training in the US. It will “avoid violations of privacy, torture and other actions that are denigrating to humanity,” Alvarado said. US Senator Robert Menendez, who heads the Foreign Relations Committee in the Senate, said this week that Ecuador risks losing the benefits it enjoys under two trade programs because of its stance on the NSA whistleblower. “Our government will not reward countries for bad behavior,” he said. The US is Ecuador’s prime trade partner, with over 40 percent of exports going to the US market. Both programs were due to expire by the end of next month and were subject to congressional review. Before the Snowden debacle arose, the US legislature was expected to scrap one of them while renewing another one. Snowden has applied for political asylum, hoping to find protection from American prosecutors, who charged him with espionage over his leaking of classified documents on US surveillance programs. He is currently thought to be staying in the transit zone of a Moscow airport. He became stranded in the Russian capital after arriving from Hong Kong, because the US annulled his travel passport as part of its effort to get him to American soil for trial.